I am not usually this on top of my game, but I woke up early enough to boot up my Japanese TV service and watch a little Fortune Dream! This will not be a typical review because I am only reviewing one match, so instead of doing it my usual way I am going to give a bit more of a history lesson so that the entire review isn’t 200 words. 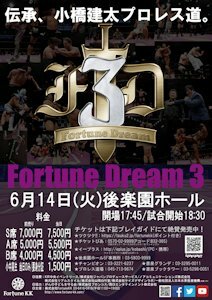 To start, “Fortune Dream” is a series of produced shows by the legendary Kenta Kobashi. They don’t run very often, so its a special occasion when it does, and it is one of those situations where the wrestlers seem to try harder than usual as to not disappoint a wrestler of his caliber. This is both wrestlers’ second match on a Fortune Dream card, as Matsumoto defeated Meiko Satomura at Fortune Dream 1 and Hojo lost to Satomura on Fortune Dream 2. Surprisingly, this is Hojo and Matsumoto’s first ever singles match even though Matsumoto is a regular wrestler in Stardom, where Hojo has wrestled since her debut in 2012. Even though this is their first singles match, Matsumoto and Hojo have faced off in tag team action many times. Four times they have been on opposite teams in a title match for the Artist of Stardom Championship (they are 2-2 in those matches), and they have been on different times a total of four times this year as well as teaming up once. Matsumoto is not in a faction in Stardom so she is not a rival of Hojo, however when given the chance they have no issue in trading blows with each other. On the surface, nothing is really at stake in this match as it is away from Hojo’s home turf, however there is a bigger story here. For the last year, Hojo has been having issues breaking through that last tier to reach the top of Stardom. She couldn’t beat Meiko Satomura, she couldn’t beat Io Shirai, and it took her three tries to beat Santana Garrett. She can win against everyone else (Act Yasukawa before she retired, all the rookies, etc.) but she can’t quite make it to Ace status. Even though Matsumoto isn’t ranked in the traditional way in Stardom since she is not an affiliated wrestler, she does represent a respected veteran that Hojo has never defeated before by herself. Kairi Hojo wears her heart on her sleeve, the crowd loves her and wants to see her finally succeed in moving up the ranks in Stardom. Matsumoto has less to prove here, but plays the role of very difficult to beat veteran Freelancer that finds success in a number of promotions in Japan. Matsumoto has only been pinned once in 2016 in a singles match leading up to this and has won matches in Stardom, Sendai Girls’, OZ Academy, Hikaru Shida Produce, Ice Ribbon, REINA, and WAVE. In Stardom, Matsumoto typically participates in midcard tag matches but generally is on the winning team and doesn’t take the pinfall if her team does happen to lose. It is rare for a pure Freelancer to have so much success as in most situations Freelancers are used to put over the promotion’s talent, so it says a lot about Matsumoto’s abilities that she wrecks havoc wherever she goes. A win by either Hojo or Matsumoto would be a big deal in Stardom, and even though it is away from home this is a major Independent event that has been well covered in Japanese publications due to Kobashi’s popularity. If from the above description you were under the assumption that this match would start clean and friendly, you were incorrect, as Hojo attacks Matsumoto before the match while she is posing with her dinosaur head. Hojo puts the head onto Matsumoto and dropkicks her, which is a throwback to when Matsumoto did that to Mayu Iwatani in Stardom a few months ago. Matsumoto fires up from this lack of respect and starts throwing elbows, but Hojo holds her ground so Matsumoto works the headlock instead. They reach a stalemate until Matsumoto hits a hard shoulderblock, but Hojo comes back with a spinning headscissors. Lots of chops by Hojo but Matsumoto isn’t weakened enough to be picked up and she regains control of the match. Matsumoto slams Hojo around the ring before getting to work on Hojo’s back, applying a deep crab hold until Hojo gets to the ropes. Matsumoto gets Hojo up onto her shoulders, she gets a running start and tosses her over the top rope to the floor, right on top of Hojo’s seconds in Jungle Kyouna and Hiromi Mimura (Stardom rookies). Matsumoto sets up Hojo in front of the ring post, she then charges her and squishes Hojo against the metal with a body avalanche. Back in the ring, missile dropkick by Matsumoto and we get the first cover of the match for a two count. Matsumoto gets Hojo up but Hojo wiggles away, she goes for a spear but Matsumoto sidesteps it. Matsumoto goes off the ropes but Hojo tries again and this time nails the spear, sending Matsumoto out of the ring. In a move I have never seen her do before (big matches lead to big risks), Hojo goes for a triple jump springboard plancha down onto Matsumoto but trips a bit, barely making it over the top and onto her foe. Could have been smoother, but going for big moves like that just shows how important the match is to the young star. Back in, swinging neckbreaker by Hojo and she covers Matsumoto for a nearfall. Hojo gets on Matsumoto’s back but Matsumoto flings her off like a child, Hojo returns to her feet and the pair trade strikes. Final Cut by Hojo, she goes up top but Matsumoto joins her. Hojo headbutts Matsumoto down into the Tree of Woe, and she delivers a diving footstomp to Matsumoto’s chest. Hojo goes back up top but Matsumoto rolls out of the way of the world famous Diving Elbow Drop. Hojo reverses Matsumoto’s sliding lariat and hits the Sliding D, but Matsumoto kicks out of the pin. Now Matsumoto is able to connect with the sliding lariat, she goes for a backdrop suplex but Hojo reverses it into a roll-up. Gedo Clutch folded back into a bridge by Hojo, but Matsumoto fights out of it. Matsumoto grabs Hojo and tosses her up into a backdrop suplex, she goes for a powerbomb but Hojo pushes out of it. Hojo goes for a spear but Matsumoto blocks it, she gets Hojo on her shoulders and drops her with a gutbuster. Reverse double kneedrop by Matsumoto, but Hojo barely gets a shoulder up on the cover. Matsumoto goes for a backdrop driver but Hojo blocks it, spinning elbow by Matsumoto and she drills Hojo with the backdrop driver! Cover by Matsumoto, but as the referee starts the count the bell rings, signifying time has expired. The match is a Draw. Of all the possible results, this was the least surprising. Both of these wrestlers lose extremely sparingly, as even though Hojo is on a year-long quest to prove herself, she still has only been pinned twice since last summer in singles matches. Having Hojo overcome a major obstacle like Matsumoto in a promotion outside of Stardom wouldn’t have been very logical since it would be better in front of their home crowd, but not as illogical as Hojo losing against a frequent Stardom wrestler if a title was not on the line. While I am all for matches having more satisfying conclusions, this was such an entertaining and well done match that it isn’t a huge deal as it was more of a special attraction match than anything else.